German Chancellor Angela Merkel has arrived in Nigeria. 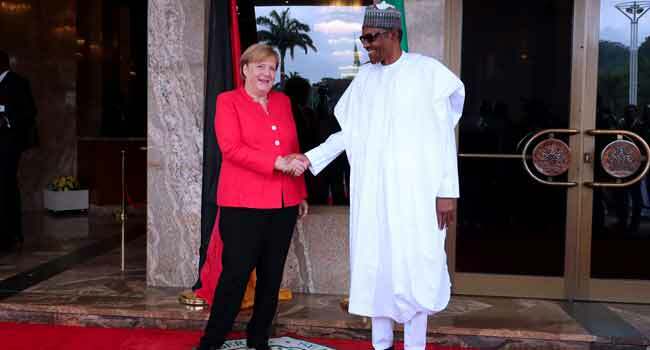 Shortly after her arrival, Merkel was received by President Muhammadu Buhari at the Aso Villa in Abuja, the nation’s capital. Merkel is being accompanied to Nigeria by a German Business Delegation. The German team consequently held a meeting with the Nigerian delegation led by the Minister of Industry, Trade and Investment, Dr Okechukwu Enelamah. Meeting with German Business Delegation accompanying Chancellor Merkel to Nigeria. Minister of @TradeInvestNG, @OkeyEnelamah presiding; Nigerian Ambassador to Germany @YusufTuggar in attendance. 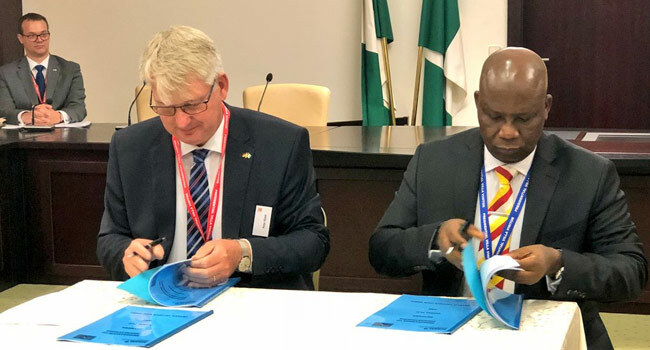 Those in attendance are Nigerian Ambassador to Germany, Yusuf Tuggar, as well as top officials of the Nigerian Electricity Regulatory Commission (NERC) and other government agencies. 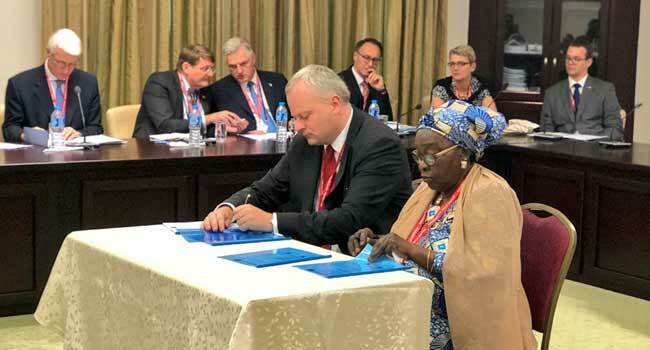 At the meeting, a Memorandum of Understanding was signed between the German-African Business Association and the Nigerian Association of Chambers of Commerce, Industry, Mines and Agriculture (NACCIMA). 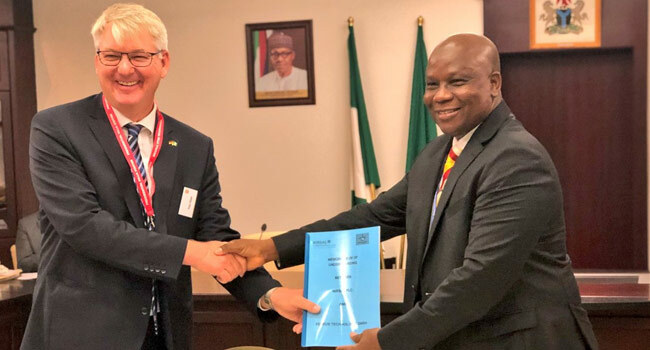 Another agreement was also signed between the Nigeria Incentive-Based Risk Sharing System for Agricultural Lending (NIRSAL) and Petkus Technologie GmbH. 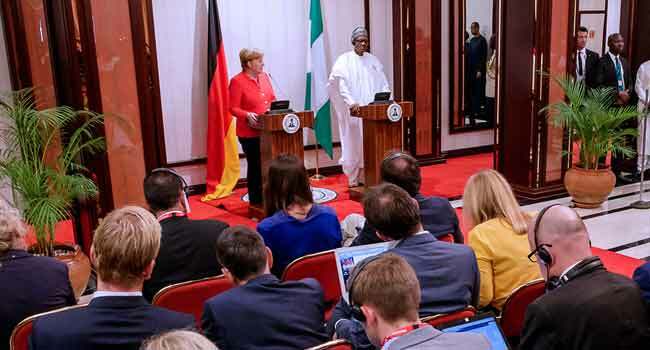 After the meeting, President Buhari and Merkel addressed a press conference at the State House. 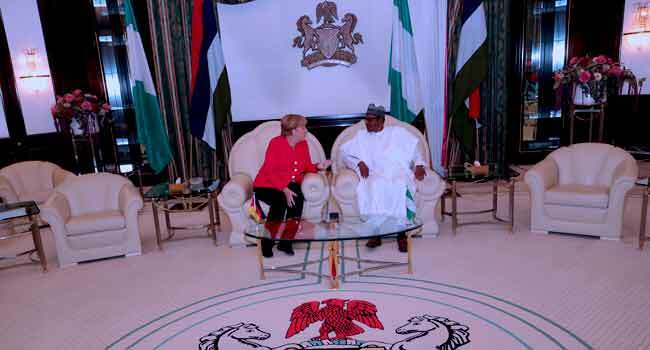 At the briefing, President Buhari told the German Chancellor that his administration was not in support of illegal migration. He said, “I’m against my countrymen and women who illegally find their way to other countries. The President stressed that anyone who feels that his country does not value him or offer him what he should be offered as a citizen and decides to embark on the perilous journey is doing it at his own risk. Merkel’s visit to Nigeria comes two days after President Buhari hosted British Prime Minister Theresa May.